Mike Wirths is one of the world class imagers today. We have selected a subset of his images to illustrate phenomena and processes that are accessible to amateur telescopes and cameras - as well as to visual observers with powerful telescopes. The red boxes in this image provide the locations of the images below. Here's Mike - no wonder he's smiling, just look at the weather at his Equluus South Observatory ! Note the tech specs. Let's start with the immediate neighbourhood of the impact crater Plato - always a favourite with amateur astronomers. There is so much to see in this image. Mare Imbrium forms the smooth plain to the South, while in the North we see Mare Frigoris. Plato crater has been flooded by much younger basalt lavas, almost certainly related to the lavas that filled the Mare Imbrium immediately to the South. Since the crater wall is intact, flooding of Plato must've occurred through its floor. To the NE of Plato crater we see the sinuous Plato Rima, a channel - 100s of km long - that formed by the collapse of a massive lava tube. Note how the channel is discontinuous at its NE end : the gaps represent sections of lava tube roof that have not collapsed. A second, shorter channel can also be seen due north of Plato crater. At top-right of the image we see the iconic Alpine Valley, generally considered to be the type rift valley on the Moon - analogous to the Ottawa Valley (and other better known rifts !). Standing proud of the lavas in Mare Imbrium we see a number of Sun illuminated isolated peaks : parts of the original Imbrium floor. Some interpret these as remnants of a now drowned inner ring - part of the multi-ring structure that defines large Impact Basins. Here we see the Alpine Valley in exceptional detail. Note how different the two sides of the "rift" valley look. The SE side is indeed marked by a straight fault, but the opposite side is quite irregular in outline. This looks to me like a "half-graben", similar to a rift but with a clear cut fault only on one side. This means the valley floor would have broken at the fault and bent (hinged) on the other side. The valley floor is now flat because it has been flooded by basalt lava, perhaps from Mars Imbrium - who knows. Notice the younger erosional lava channel within the lavas of the Alpine Valley : a testament to the high resolution of this image. In the NW corner of the image you can clearly see a short NS segment of Plato Rima : it's made of a chain of pits that formed by the collapse of the roof of the original lava tube. In this high-resolution detailed image of Plato crater, the relatively young age of the basalt lavas that drowned the crater floor is evident from the small number of impact craters, compared to those outside the crater. Slumps and landslides that affected the impact crater walls are younger than the initial transient cavity, but older than the lavas that flooded the interior of the crater. Parts of the Rimae can be seen due north and to the NE of the crater walls. 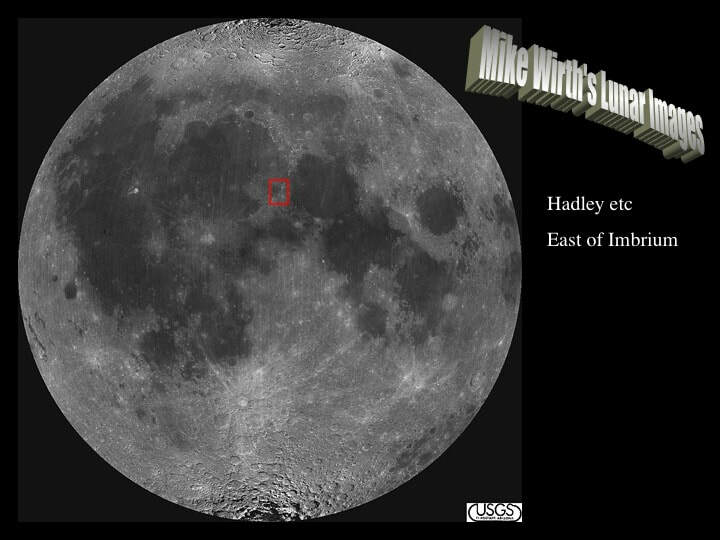 Hadley Rille (channel) lies at the eastern margin of Mare Imbrium. The channel shows more extreme meandering than does Plato Rima, suggesting it was carved by a flowing fluid : basalt lava. There are no discontinous segments to indicate the presence of remnant roof components of a lava tube. Was it an open channel ? Whatever, it clearly cuts the lavas of Mare Imbrium, and so must be younger. X marks the Apollo 15 land-site. This image captures the boundary between Mare Serenitatis (north) and Mare Tranquilitatis (south). It nicely brings out the distinct difference between simple and complex impact craters : the latter have slumped, terraced walls and central peaks, and are rimmed by proximal ejecta deposits. To the left of the image, the NNW-SSE lineaments are scars in bedrock formed by the ejecta thrown out of Mare Imbrium, 1000s km to the NNW : hence Imbrium must be the younger Impact Basin. Note the darker grey of the basalt lavas at the southern edge of Serenitatis. This reflects a different chemical composition compared with the lighter grey lavas. It also highlights that the Serenitatis basin was filled by a sequence of lavas progressively through time. The dark grey lavas at the edge of the basin lie directly on the basin floor, so the lighter grey lavas must be younger. The dark grey lavas are cut by long, narrow parallel-sided rifts adjacent to the basin margin, while the light grey lavas within the basin are affected by wrinkle ridges. The rifts represent extension of the edge of the basin as the basin floor was flexed downward under the weight of the lavas lavas accumulating within the basin. The wrinkles represent shortening of lavas within the upper part of the basin in response to the same subsidence. On the opposite rim of Mare Serenitatis, we see several complex impact craters. To the South is a flooded impact crater whose eastern rim progressively decreases in height westward until it disappears beneath the lavas that flooded the impact basin. The impact crater must therefore have been tilted down to the West, thereby illustrating the downward flexing of the Mare Serenitatis margin as the lavas accumulated on the impact basin floor. The large Posidonius crater shows a number of features : a partial ring of small bright hills are the relics of its central peak, standing proud of the basalt lavas that flooded the crater. As for Plato crater, the lavas likely floodded the crater via its fractured floor, but those same lavas are now fractured. Hence, something happened to fracture the crater floor both pre- and post-flooding. Just west of the last image, this is a very high resolution image of symmetrically hexagonal Lacus Mortis. It appears to be a large crater flooded by basalt lavas - but how did it form its shape ? I have no explanation for this at this time (However - see here). Its eastern wall has almost disappeared beneath the lavas of adjacent Mare Frigoris, so it must've been tilted to the East. The floor of Lacus Mortis shows a number of features that post date the flood lavas. Rima Burg trends ENE across the western wall of the Lacus. At this resolution, it appears to be comprised of a chain of collapse? pits. Adjacent to the SW wall of the Lacus is a linear shadow that indicates the presence of a west-facing fault escarpment. Complex crater Burg is younger than the Lacus and its flood lavas. It nicely illustrates slumping and land-sliding of its interior walls, as well as a central peak. The right side of the image shows us blast scars in the upper part and "pimples" in the lower part of the photo. The former may represent erosion of bedrock by ejecta from the Crisium impact basin to the SE. The latter may represent more locally ejected blocks - but from where ? Our last image is of Cauchy crater located between its spatially associated Rupes (ridge) and Rima (channel), developed in the lavas of Mare Tranquilitatis. Sunlight from the West tells us that the former lies to the left of the latter here. To the left of Rupes Cauchy we can clearly see at leat two round volcanic domes, the eastern of which has a very clear summit crater : these are clearly volcanoes ! More volcanic domes are apparent at the NW ends of both Rupes Cauchy and Rima Cauchy : can you spot any more summit craters ? In the lower left of the image are a number of crescent shaped crater rims illuminated by sunlight. These are flooded impact craters. In all likelyhood, the impacts that formed them occurred after early lavas had flooded the impact basin, but before later lavas had finished erupting. Alternatively, the craters are in the floor of the basin and the flood lavas are very thin here at the basin margins.